Today I had to take Jackson to the pediatrician, for what was supposed to be his 18 month vaccines. We didn’t get them done 2 weeks ago when we went because he was all sorts of sick–ear infection, eye infection, sinus infection. So, instead of shots he got a prescription for Amoxicillin and eye drops, and an appointment for..well, today. But lo-and-behold, we left without shots again. Instead, today we got a diagnosis for a DOUBLE ear infection and, oh yeah, what looks to be a reaction to the Amoxicillin. I’m confused about the reaction, frankly. J finished the Amoxicillin last Tuesday. 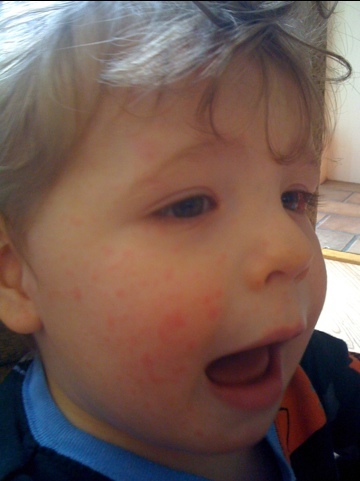 He got a raging rash on Sunday (some of you on Twitter saw me asking about it). No itching, it didn’t bother him, no fever. After discussing it with us, the on-call doc on Sunday thought it was a viral something or other (probably picked up at daycare), and that it should run its course in about 48 hours. And sure enough, on Monday it was lighter and today it was even lighter (but not gone, obviously). Rashy, yet happy on Sunday. Go figure. So today when the pediatrician saw J, her reaction was “uh, what’s all THIS?” I went through it all, she looked in his notes, and….determined it to be a reaction to the Amox. Even though the rash started 5 days after the course was finished. Apparently it’s uncommon, but not unheard of for a reaction to happen that late. Fantastic. Even if I’m not 100% convinced, there’s enough evidence there to take it seriously. Of course it has to be the most prescribed antibiotic for kids. And of course, the new one is WAY more expensive. Of course. And then there’s the double ear infection. Here’s the thing. This kid is a SPARTAN. He does not complain. He does not make it known that he is hurting or uncomfortable. Even though the doctor asked about 5 times, he never ran a high fever and never seemed more grouchy than normal. He’s mostly a good natured kid–who is a toddler and throws tantrums and is mercurial as all hell, but a happy kid MOST of the time. So this came out of left field. Again. I feel really weird about this whole string of events. It’s not guilt, exactly, so much as it’s a worry that we’re missing stuff because he’s so good natured. I mean, hopefully when he can talk some of this will go away–he’ll be able to let us know. But for now, I wonder–how much are we missing? Are we attributing more serious concerns to the typical toddler melt-down points: tantrum, teething, tiredness? How do you miss a reaction to a drug (ok, granted, we were listening to the on-call doc. But still). And a bigger question–how do you keep him healthy when he doesn’t let us know he’s sick? As I said on Twitter today, it’s easy when he’s gushing from various orifices, but when it’s ears or internal? How do you do that? I guess in the end, it’s just one more way for me to question my parenting (how I hate that I do it, how I wish I wouldn’t, but don’t we all?). It’s not guilt, but it sure isn’t all sweetness and light either. When B was about 7-months old, she spent one weekend being a little fussier than normal, but I chalked it up to teething. My husband noted that she was tugging on her ears a lot, but it really only seemed to happen around naptime or bedtime. I told him that’s what she did when she was tired. He took her in for a check-up that week…and she was diagnosed with an ear infection. My husband was too smart to say I told you so (I’m sure niceness played into it, too, but he also knows I’d have probably kicked him if he said anything. ), but I felt terrible. I’m glad I’m not the only one! I know we’re going to miss stuff occasionally, but man did it make me a little overly worried for a few days! The first time an allergic reaction shows up it can take a while. It may have needed to build up in his system before there was a reaction. Nicole also had a reaction to that, and from what I understand she had a rash, but it didn’t bother her. Also remember that wedding last June, I spent most of the drive back to Arizona with a splotchy, itchy face thanks to the loction I used the day before. Also last summer I took Cirpo and the next day my ankles hurt so I went back to ask the pharmacist. She was dismissive and made me feel paranoid. Then I spent the next two to three weeks dealing with weird burning sensations in my legs and pain in my legs and feet due to a bad reaction. So missing allergic reactions probably happens a lot. I had no idea that it could take so long for a reaction to appear. I would have bet money that it would either be during the course, or within a day or two max. Which I *kinda* wish the pediatrician or pharmacist had warned me of before hand, but like you said, it probably gets missed a lot. You bring up a good point, if your child is not a squeaky wheel, so to speak, how do you gauge how serious it is? My 4 yo is very emotional, happy mostly, but if something is wrong we always know. But our 10 mo is really easy going and 3 weeks ago she had a double ear infection and pink eye. We took her in for the pink eye and I felt like the worst mom ever for not knowing about the ear infections. I hope your Jackson gets well soon! I also worry, not just for MY being able to figure it out (though there’s that), but also anyone watching him. You know, if he doesn’t let on that he’s sick, would the daycare see signs, or the babysitter, or family? (I know, there’s a tad bit of paranoia there too, but still…). If he’s not squeaky with me, he’s definitely not squeaky with other people! Yeah, when Charlotte is sick she’s a whining, sniveling, cranky, television-demanding nightmare. I guess it’s handy when I think of your situation. I know when she’s sick. But, good lord, is it exhausting! I hope that infection clears up soon. Holy hell. Poor kid. And poor you guys. He’s finally starting to show some signs–cranky, wanting to cuddle with me (not daddy though! ), not sleeping well. But it took all this time for him to really start acting that way so much. It’s such a guessing game. My daughter seems to throw up easily (teething, coughing) and I never know until later if she had a stomach bug. She’s two and starting to be able to tell me when she’s sick but not really in words. I look forward to when she can actually say, “My throat hurts” (not that I want her throat to hurt…). Oh, the throwing up thing, I feel for you on that. I would constantly be second guessing sick/teething/coughing/other? Yeah, Jackson did a bunch of ear pulling a few months ago, so THEN I thought ear infection. Nope, teething. It’s like he was *trying* to confuse me! I just have to be grateful we went back for the missed vaccines (which we now have to try a 3rd time to get), otherwise who knows whether he’d still be suffering in silence? I guess I’d ask whether Jackson is suffering in silence or whether he’s just not that bothered by what ails him. I think about being a kid … and remembering that I’d get sick, but wouldn’t ever “hurt” … I’d just feel yucky. Whereas other kids would complain about lots of aches and pains. Maybe you’ve got a thick skinned kid who just isn’t bothered by some of the ailments that bring other kids to tears? We’ve pretty much gathered that, for the most part, the kid has a pretty high pain threshold. So yeah, I think he’s not just bothered by a lot of it. Which is great when he is sick (and we know it) because he’s usually in pretty decent spirits–even if he’s a little more clingy than normal. Mittens is similar to J in that she doesn’t usually alert us to being sick, either, except when she’s got a fever. I read somewhere that if the child is acting fairly normal, there’s nothing to worry about, so I try to keep that in mind (which is tough considering I’m always paranoid that she’s secretly harboring something more serious). Also, she periodically has a face rash just like J’s, and our ped chalks it up to viruses. The rash has hit multiple times and she’s only been on antibiotics twice. It’s so hard to keep that in mind. That’s always what our pediatrician says, but MAN is it hard! That’s also reassuring about the rash. I’m still not sure I fully believe the peds diagnosis of the antibiotic reaction–though I’ll defer to her for now–but it’s good to hear you’ve faced a similar thing with a different diagnosis. Ahhh, adverse medication reactions! How I loathe thee!! Thankfully there are plenty of other antibiotics out there but, yeah… price. Ick. Hell, I wish *I* was like that. I’m the biggest baby on the planet when I’m sick! A double ear infection? There’d be moaning and rending of garments! Hmmm…. I wonder if that was the cause of a mysterious rash my son had when he was little. I’d never heard of that much of a delay before. My heart goes out to you. It is so hard when your baby obviously can’t tell you that their tummy hurts or they are itchy or they have a headache, a pain here or there… it leaves mommy to guessing and then like your situation, when there are no obvious signs like crying or moodiness, how would you ever know? What a fluke that you had to go back this particular time. I guess it was a blessing in disguise even though the little one is sick, at least you got the medical attention he needed. Give him lots of love! I wish him a speedy recovery! I’m SO grateful we had to go back! I have no idea if we’d have figured it out ourselves otherwise! As the parent of a delicate flower who moans for days each time she gets a sore throat, I am envious. Really, I wouldn’t worry. When it gets serious, he or his body will let you know in unmistakable ways (high fever, crying, etc.). No one wants their kid to be in pain, but I think he’s making it clear that he processes pain differently and that it doesn’t bother him the same way it might bother my daughter. We are lucky that he’s got such a high threshold (and trust me, I don’t take that for granted!). I think it really comes down to, honestly, my control freak nature. If I don’t know what the “breaking” point, so to say, is, then how can I accurately prepare/take care of him/fix it?